I’d have to slather a different color all over everything, but I love it otherwise! Now this I don’t like at all. It’s a shade of blue I dislike ant it looks too much like a railway carriage. 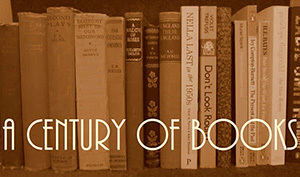 But it’s good to see such a diversity of book rooms, we can’t like ’em all, can we? 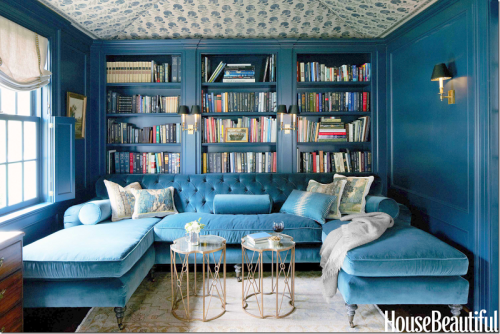 This is a bit too much blue for me, though the ceiling & rug lighten it up a bit. And those tiny little lamps high up are going to be hopeless for reading, at least for my eyes. I also think that couch (?) would be more conducive to napping than reading – I could easily see myself drifting off. I love blue, so I’m predisposed to loving this. I would,however, have changed the sofa to a neutral color and let the walls be the focus. Lovely sofa though. It’s a little much for me – I think I’d rather have the ceiling paper on the walls. Hahaha, I love blue, but yeah, a little less blue would be better for me. We have looked at this photo closely as we try to decide what color to paint our new library when it is finished in 11 months. I think we opted for monochrome like this but in a pale shade of a warm gray. Interesting looking library! I don’t think I would shoot for that style though. The overall look is lovely though I would not have picked this shade of blue myself. I really appreciate how the seating fits the small space so well and provides some really luxe and lush spots to enjoy some time with a book.